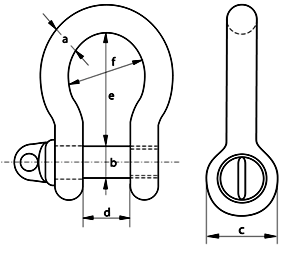 Unlike dee shackles, a bow shackle can be loaded at certain angles, though with a reduced safe working load, you can view the details of the bow shackle angles here. 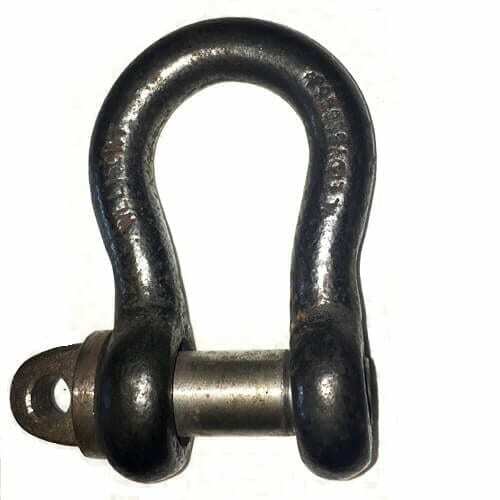 This British standard screw pin large bow shackle is suitable for many lifting tasks with a great size range available. These specific bow shaped shackles incorporate the typical screw collar pin (type A). They are manufactured from high tensile steel any come in either self colour of hot dip galvanized finishes. The sizes that Rope Services Direct are able to supply begin at 0.15 tonne and increase to 15 tonne with a maximum bow width of 5 ½ inches. The internal bow width will determine the width of sling you can attach, the sling should seat comfortably within the bowl and not crease or fold over. Screw pin shackles are easy to use and quick to attach, however with constant use the pin may become loose when friction is abundant. Hand tightening the screw pin is the most common way for this to occur; to help to prevent the pin unscrewing then tighten by hand initially then apply further force with pliers perhaps until the screw pin has cranked fully; even an extra ¼ turn can prevent it loosening. Want to buy our large bow shackle with screw pin? Buying this or any other product from Rope Services Direct couldn’t be easier; call the sales team on 01384 78004 and in just a few minutes your product will have been ordered and paid for; your items will be dispatched within a day or two usually. British Standard Screw Pin Large Bow Shackle Overall rating: 5 out of 5 based on 6 reviews.